NASA's Curiosity rover on Mars has found dark, stick-like features that are each about the size of a grain of rice. They were likely formed by crystals in water long ago on Mars, NASA scientists have said. A United Kingdom-based researcher claims he's seen evidence of ancient animal tracks on Mars, but don't get too excited. The features he's talking about are widely documented by NASA as interesting crystal shapes that likely formed in water long ago. A media frenzy ensued after the scientist said he saw evidence of branching, twisting features in pictures from NASA's Mars Curiosity rover. "If you look at the images more closely ... this actually has features in it that are reminiscent of trace fossils," said Barry DiGregorio, a research fellow at the University of Buckingham, in an interview with the Daily Star published Sunday (March 4). DiGregorio wrote the books "Mars: The Living Planet" (Frog Books, 1997) and "The Microbes of Mars" (Amazon Digital Services LLC, 2011), both of which claim to show evidence of Mars life. It's not the first time he's made these claims. 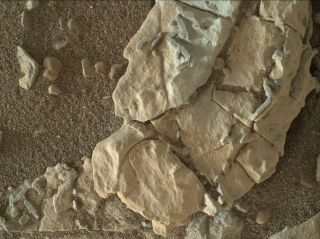 He told Space.com in January that some of Curiosity's pictures of the structures remind him of Ordovician trace fossils. At the time, Curiosity was looking at strange tubular structures. Some people claimed these formations came from burrowing creatures. Curiosity found the features on Mount Sharp, in a zone more than 1,000 vertical feet (300 meters) above the rover's landing site on the floor of Gale Crater. "When we looked at these things close up, they're linear, but they're not tubular in the sense of being cylinders; they're actually quite angular," said Curiosity mission scientist Ashwin Vasavada, of NASA's Jet Propulsion Laboratory in Pasadena, California, in a Space.com interview in January. "They have kind of a square or a parallelogram sort of cross section and form at angles to each other when there's multiple of them together," he added. "And all of that's pretty reminiscent of crystalline growth." The crystals' history likely does include liquid water, Vasavada said. He added that the team was considering two scenarios, both of which require water. The first suggests that the tubes are crystals themselves, and the second says that the crystals created a mold in the rock that sedimentary materials later filled. In a separate interview in January, Vasavada added that it is difficult to definitively say if the features are biological in origin, but that is not a conclusion NASA would jump to quickly. "That's pretty challenging on Earth to distinguish those two things without being able to put these things into a lab to look for the presence of organics," Vasavada said. "We have a very limited capability overall to understand whether something is biological or not." In mid-February, NASA said Curiosity discovered tiny, dark bumps that look similar to features that form around gypsum crystals in drying lakes on Earth. "These [types of features] can form when salts become concentrated in water, such as in an evaporating lake," Sanjeev Gupta, a Curiosity science team member at Imperial College London, said in a statement from NASA's Jet Propulsion Laboratory. NASA is still trying to learn when the crystal features formed, in relation to when sediments around them piled up. The crystals might have formed underground (after the sediments were hard rock) or in wet sediment, while the lake was drying. This stereo view of Mars rock by NASA's Curiosity rover shows small hollows that have a "swallowtail" shape similar to that of gypsum crystals on Earth. NASA scientists say the features were formed by crystals that later dissolved away. It's unclear if life exists on Mars today or if it ever did. Some researchers are excited about features such as recurring slope lineae, which are dark streaks that appear on the sides of craters — predominantly during warmer months. But it's unclear if the streaks are due to briny water or dry soil flow. There are several missions at Mars trying to determine how habitable the planet was in the ancient past. Pictures from orbit clearly show ancient water channels, while rovers on the ground have seen many types of rocks altered by water. But eons ago, the extensive running water diminished and Mars became a dusty, windy planet. Some investigators suggest that Mars had a thicker atmosphere in the ancient past and that the atmosphere thinned as the sun pushed lighter particles out into space, drying up the surface. NASA's MAVEN mission is investigating atmospheric loss on Mars. The Curiosity rover is on a hunt for ancient habitable environments. NASA and the European Space Agency also have newer Mars rovers on the way to seek signs of habitability; NASA's Mars 2020 will cache promising samples, while ESA's ExoMars rover can drill below the surface.